Arrow Performance Enhancement For Your Crossbolts. Each 6 pack of APE X Bolts includes 6 Lighted Nocks! Swiss precision design 6061 T6 aircraft aluminum gives the APE X Bolt flawless flight. The APE X Bolt Tail was specifically designed for crossbolts. The APE X Bolt features an exclusive vane design from Norway and allows the bolt to stabalize quickly on today’s modern X Bows. Shots with the APE X Tail and the Fusion vane are absolutely deadly! Enjoy the benefits of instant fletch replacement and superior penetration on your bolts with APE X Tails. Each package of APE X Bolt Tails includes 6 Fletch Bodies, 6 Nock Caps with Half Moon or Flat Nocks, 6 Red Lighted Nocks and 23 Fusion Vanes (extras for your first 5 replacements!). APE X Bolt Tails are available only in Black 2° offset fletch slot models and come with Red and White Fusion vanes and 6 Red Lighted Moon or Flat Nocks. Install to your bolt by cutting off approx. 3.4″ (nock included – see Installation Demo on our Home page) from the nock end of your bolt and thread to the bolt via using your bolt’s required aluminum insert. The APE X body design includes the proper radius to keep the bolt secure under your bow’s bolt keeper. 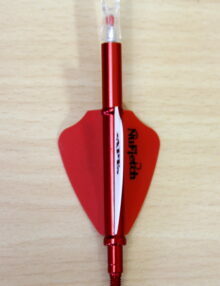 Achieve instant fletching on your bolt and guarantee Flatter, More Accurate shooting with Deeper Penetration! 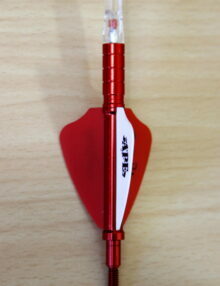 Arrow Performance Enhancement For Your Reduced Diameter Arrows. Swiss machined fletch bodies made from select 6061 T6 aircraft aluminum, the APE Light allows for precise 120° fletch slot spacing on reduced diameter arrows. The APE Light is slimmed down to fit the reduced diameter of the arrows such as the Full Metal Jacket (.265-.275 – see Product Description Tab Below For Arrow Sizing Guide). APE Light products are available with straight or 2° offset fletch slot options. 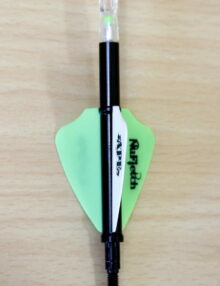 Arrow Performance Enhancement For Your Standard Carbon Arrows. 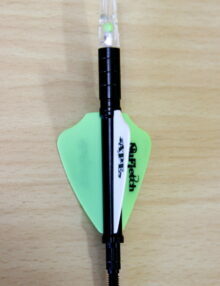 Each 6 pack of “Standard” APE Arrow Tails includes 6 Lighted Nocks! Swiss precision machined fletch bodies made from select 6061 T6 aircraft grade aluminum. Precision 120° milled fletch slot spacing allows for precision fletch alignment. Each package of Standard APE Arrow Tails includes 6 Fletch Bodies, 6 Nock Caps, 6 fully indexable lighted nocks, 6 battery light sticks to light the nocks and 23 Fusion Vanes (the extras are for your first 5 replacements!). 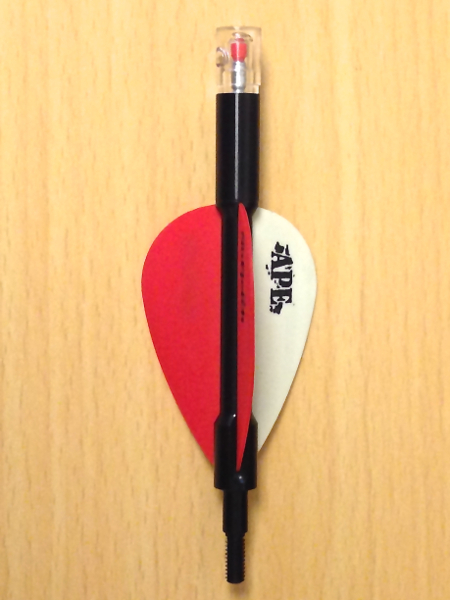 Standard APE Arrow Tails products are available with straight or 2° offset fletch slot options.